Make any watch a smartwatch with this sweat- and splash-resistant disc. Place it on the back of your usual timepiece, and it works with the Chronos Bluetooth-connected app to enable smart functions like counting steps, controlling the camera, and receiving text and email alerts. It can even locate your phone with a tap. Now your favorite watch has a higher IQ. Dimensions: 1.3" x 1.3" x 0.12"
We'll see how this one turns out. I so want this device to work, but it's resisting my efforts. Like so many other fools, I ignored all the reports of backs falling off, nonexistent Customer Service, and general bad business practices and ordered one of these anyway. The back fell off the thing on the FIRST day I wore it, all of my emails to Chronos (the ONLY contact information the company has) were ignored, and I’m out $100 plus shipping. I have NO complaint with The Grommet; they are a wonderful company and I’ve Never had a problem with anything I’ve ordered from them - until now. The problem is with Chronos, the crooks who make this defective product and then refuse to fix/replace it when it breaks. 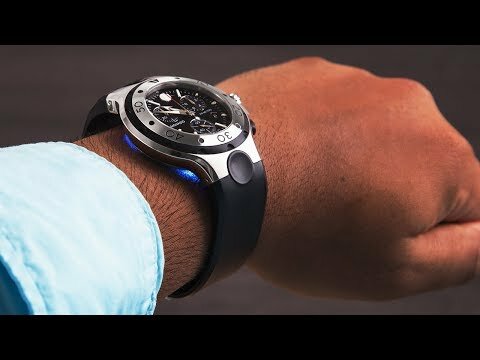 Make any watch a smartwatch. Chronos attaches to the back of a traditional watch, transforming it into a step-tracking, call-silencing, notification-pushing timepiece. This small, low-profile disc syncs through a Bluetooth-connected app and does everything from receiving email notifications to locating your phone and controlling it’s camera and music. 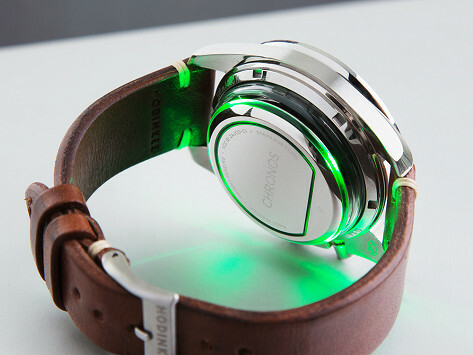 Tell Chronos how you’d like to be alerted by customizing the vibration and LED light pulses. Not only is it smart, it’s also sweat-, splash-, and rain-proof, too. You don’t have to bargain between looks and functionality. This smart little device easily smartens up your favorite watch.